Radio420™: MNE Announces 50% Off Sale through Sunday, October 7th! 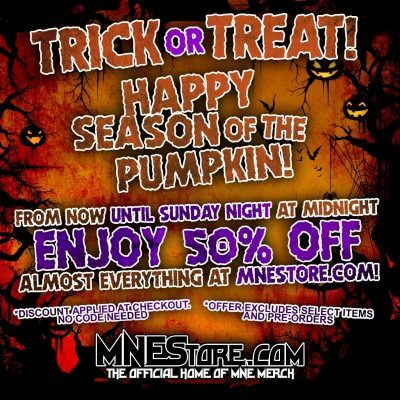 MNE Announces 50% Off Sale through Sunday, October 7th! Not long ago, anyone who gets regular updates via email from MNEStore.com probably received one about a sale happening RIGHT NOW. For those who don’t, there’s a Season Of The Pumpkin Sale in which most items are 50% Off! We’re talking just about everything, including the brand new Twiztid Masks! The only things that aren’t 1/2 off seem to be pre-orders, and items that are already marked for clearance.